I realize it was a little backwards to post the dessert half of my spaghetti squash dinner first, but let’s be honest that is always the best part! (Also don’t forget to go over and enter my coconut oil giveaway here!) Here is how I used the other half of our seven pound spaghetti squash. I was kind of winging it with this recipe, which caused a bit of challenge naming it. This recipe is a great way to enter fall; you get to use your winter squash, but still get a summery feel with the Mediterranean flavors. 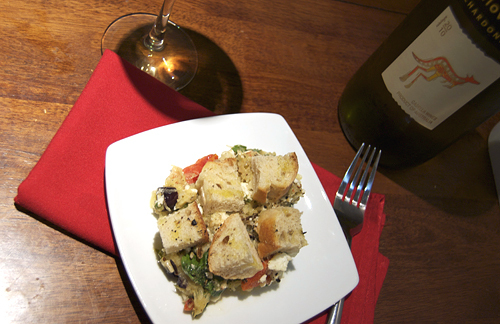 This dish has great Mediterranean flavors. 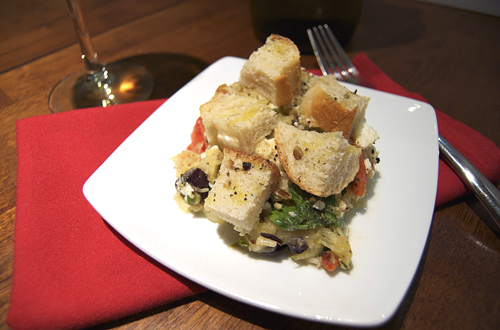 It is packed with all sorts of veggies, including spinach, artichoke, tomatoes, spinach, olives, plus delicious feta cheese. The spaghetti squash has a very soft texture, so I think it is important to add lots of the bread cubes to add a nice crunch to the dish. Combine all of the ingredients in a large bowl until evenly distributed. 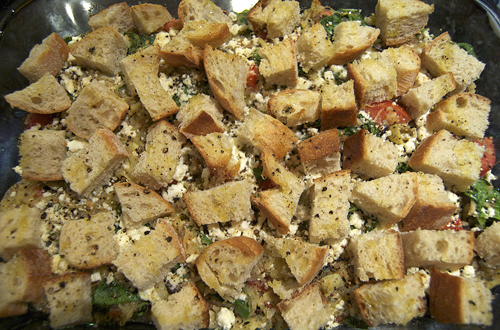 Place in a greased 8x11" casserole dish and top with bread cubes. Drizzle 1 tbsp olive oil over the top of the bread and season with salt and pepper. Baked uncovered at 375F until bread is crispy (about 30-45 minutes). FYI….this is only 5pp on Weight Watchers when serving 6 people…what a deal! Plan on making it tonight for dinner! That is awesome to hear, glad you like it! 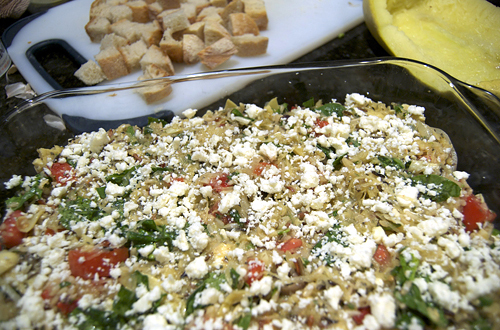 Great vegetable casserole, hearty and homey.I imagine the Mediterranean touch gives this dish some zing! Thanks for sharing! This looks delicious. I’m wondering if it could be made in a crockpot? It seems like it would be a nice thing to come home to on a cold winter evening. I also think it would be delicious with some homemade bread on the side too, instead of mixed in…more like a stew you eat with bread. Quick question — how much feta did you put in? Thanks for sharing the recipe, it looks yummy! I put about 1/4 cup of feta in. All of the amounts are listed in the ingredient list. Hope that helps! Thanks! For some reason, I can’t find feta in the ingredient list. Maybe it has something to do with my browser? Do you cook the spinach first? If not doesn’t it water down the dish? No you don’t and you don’t have to worry, not that much liquid cooks out of the spinach.